The robbers force everyone to put their cell phones and jewelry in a bag. Ava and Lucy are forced to put in their items, which include the pill bottle. One of robbers wants the engagement ring, but Olivia refuses. Olivia goes on a tirade about what the ring is worth. Ned tells her to give up the ring. Laura turns down Tracy&apos;s offer to join her in Turkey. She says she has a life in PC and she has to reign in Lulu. Tracy decides to hire guards for security, but Laura points out that she needs to blend into the culture. Laura finally agrees to go with Tracy. Jason calls Curtis to ask for his help with the Jake issue and Curtis agrees. Jason explains to Sam what&apos;s going on. He tells her that Jake knew about the curse. Jason complains about Franco putting ideas in Jake&apos;s head. He thinks they need to get a real therapist. Jason continues to complain about Franco&apos;s influence on Jake. Sam says Liz would never endanger her kids even though she&apos;s invested in Franco. Jason says he needs to know what happened to Jake. Sam agrees to help him. Curtis wants things between him and Jordan to be more than platonic. The two kiss and make plans for a little somethin&apos; somethin&apos;. Jordan gets the call that something&apos;s happening at The Rib and heads over. Liz runs into Kiki at the hospital. She says she&apos;s volunteering in the psych ward hoping to become a nurse&apos;s aid. Kiki says she wants to honor Morgan, then asks what&apos;s going on with Franco. Kiki wonders if they got into a fight since Franco was moody and brooding this morning. Liz explains what happened with Jason and Jake. Kiki tells her not to let Jason come between her and Franco. Liz says JaSam don&apos;t trust Franco, and rightfully so. Kiki doesn&apos;t understand since Franco is a changed man...tumor, blah, blah, blah. I can&apos;t listen to those excuses anymore. Anyhoo, Kiki tells Liz not to let Jason bully her. Liz swears she&apos;ll do anything to keep her kids with her. 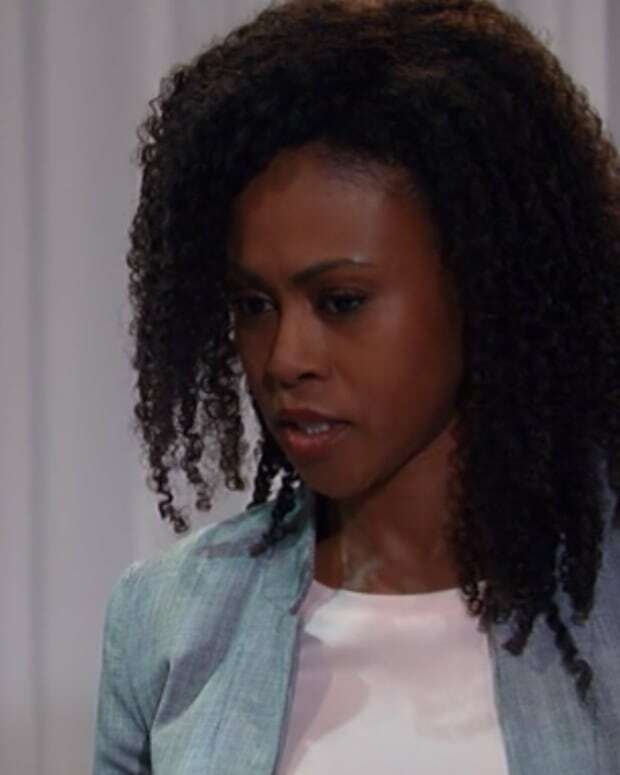 Kiki wonders if that includes ditching Franco if Jason threatens her. Kiki tells her not to let Jason take away her happiness. Franco stops by Wyndemere on the pretext of giving Nina a wedding present. He wants to discuss his problems with her. Nina gets upset when he says it&apos;s about Liz and Jake. She claims she&apos;s happy in her own marriage, which wouldn&apos;t have happened if she and Franco were still together. Nina says she has a say in Charlotte&apos;s life because she&apos;s her stepmother. She points out that Franco doesn&apos;t have the same relationship. Franco decides that means he should ask Liz to marry him. One robber aims his gun at Olivia to make her give up the ring. Ned jumps in front of Olivia as a gunshot rings out. It turns out that Jordan showed up and shot the robber in the arm. The two men are arrested. Ava wants her stuff back, namely the pill bottle. Jordan says she has to process the bag for evidence. Olivia can&apos;t believe Ned would jump in front of the gun that way. Ned apologizes to her for pressuring her to marry him. Olivia decides he&apos;s the man for her and proposes to him, which Ned accepts. Franco shows up at the hospital and proposes to Liz. Jason shows up at Wyndemere and tells Nina that he wants to speak to Valentin about Jake.